The utility of using liquid metals or ionic salts to automate casting of a telescope mirror could offer a cheap way to build a massive telescope on the moon or in space. The image above, along with details of the idea are from http://science1.nasa.gov/science-news/science-at-nasa/2008/09oct_liquidmirror/. 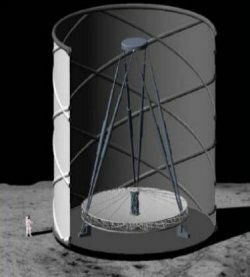 There is also information on the International Liquid Mirror Telescope Project currently building one India ( http://www.aeos.ulg.ac.be/LMT/), but there is no mention of proposals or plans to build one in space or on the moon. Are there plans or detailed conceptual studies to build and deploy a liquid space telescope in space or on the moon by NASA or any other organization? There are no serious plans at this time to build a liquid space telescope. All references I can find involve construction, as the planned size is ~100m. The plan was to use Ares 5 to help build a telescope on the moon, or similar. I'm sure this idea will come when we can get to the Moon again, and form a base, but I don't think any serious studies can be done that don't involve a human base on the Moon. Not the answer you're looking for? Browse other questions tagged future-missions telescope mission-design space-telescope or ask your own question. What is the current state of affairs concerning space telescopes? Why should the James Webb Space telescope stay in the unstable L2? Aren't the mirrors of the James Webb Space Telescope too unprotected? Any “what if” plans for space programs? What is the Dark Matter Particle Explorer telescope? Why put a telescope on moon? Could a 21 meter space telescope detect the nearest exoplanets?